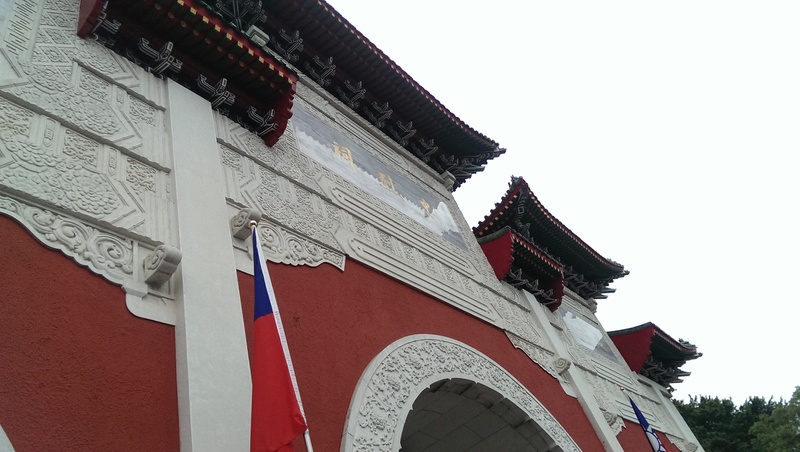 One of the great things about visiting Taiwan is that there are lots of places we’d recommend seeing when you visit Taipei and the surrounding areas. Below are 4 of our favorite places to tell tourists to check out when they are in Taiwan. 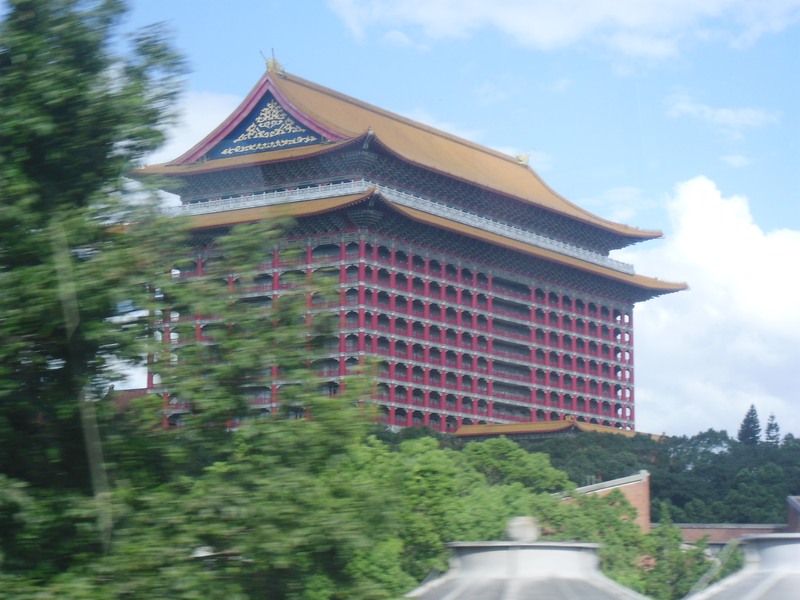 The Grand Hotel is an iconic building looking down on Taipei from it’s perch near Jiantan Station. So, if you’re planning to go to Shilin Market, why not walk an extra 15 minutes or take a bus to the hotel? If you walk there, you’ll have to climb a multitude of stairs to get to the hotel. You don’t have to be an Olympian to get there, but if you’re physically not up to the task; you can take a taxi from Jiantan. The nice thing about the walk up the small mountain is the jungle-like trees and vines that kind of provide an escape from the city even though you’re still in the city. You’ll see upon approaching the cars in front of the building that this is where the 1% stays. That being said, you can get a room here for less than $4,000 NT (about $120 USD) per night. If you’re just going there soley to marvel at the architecture; snap a view photos outside, saunter into the lobby and awe at the quentisentially Chinese red and gold. Make your way up the stairs to see the ridiculously-priced, yet equally beautiful, jade handicrafts and massive jade sculptures. Also on the second level you’ll find pictures of foreign dignitaries from the past meeting with Taiwanese offiicials at the hotel. Many are very reognizable A-list celebrities. Your stay at the hotel doesn’t need to be long, but it’s worth it to see the building that seems to stand guard over the city. >> Click here to schedule your stay at the Grand Hotel now!! 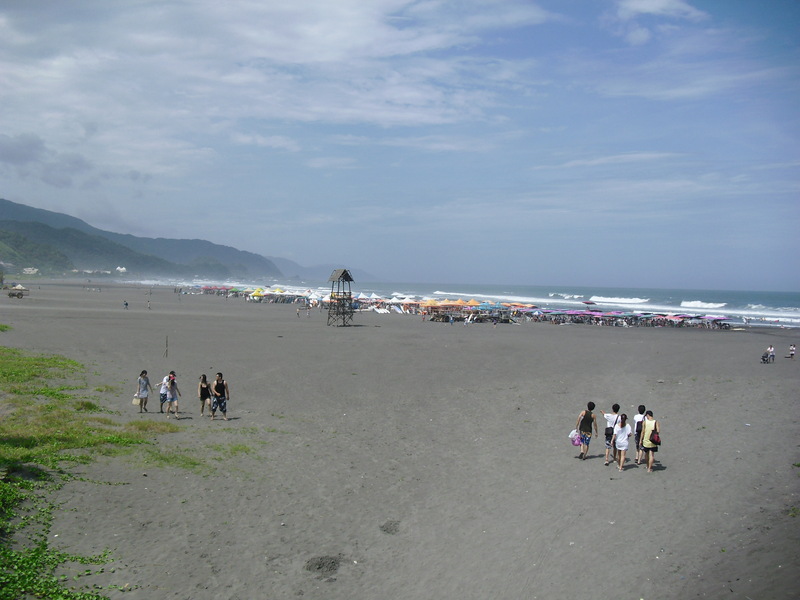 One drawback of Northern Taiwan is a lack of Thailand-style beaches. The most popular beach is Fulong Beach located about an hour from Taipei. For adults lacking children and looking for a place to party Fulong might be a bit of a drag due to the crowds of families with children and the way it’s controlled by local commerce. If you’re looking to surf, drink beer, or just admire the bikinis strolling by the Wushigang is the beach for you. It’s far from the most beautiful beach you’ll ever see, but the fact that you can take a bus right to it from the middle of Taipei in about an hour makes it worth the trip. The sand is admittedly not ideal with it’s grey tinge, but during the summer the water is warm, the waves are good, and the vibe is a relaxed mix of partiers and lazy sleepers alike. One of the very best parts about going to Wushigang is ice cold beer can be purchased right on the beach for $35 NT ($1USD). There is not a lot of development here, but it is very much up-and-coming. Near the beach you can find Wushi Harbor and the Lanyang Museum which features a history of the local area in an odd triangle-shaped concrete behemoth of a structure. There is also a great view of Turtle Island. You can take a ferry to the island, but you have to book well in advance to see the only truely active vocano in Taiwan. A walk up the beach will take you to a giant Mr. Brown coffee-Taiwanese staple. Here you can of course buy coffee but also alcohol. Keeping walking and you’ll eventually get to Waiao beach. Again not the most aesthetically pleasing strip of sand, but a great place to learn to surf. There are a few places that rent out surf boards and there is a hostel and highly-recommended bar/pizzeria called Drifters. This establishment is very popular with the local expats due to the authentic pizza and dangerous margaritas. Be careful of the margaritas or you may be taking the first train back to the city with a nasty headache rather than enjoying a relaxing day on the beach. One thing you should definitely do when you’re in Taipei is hike up Elephant Mountain. 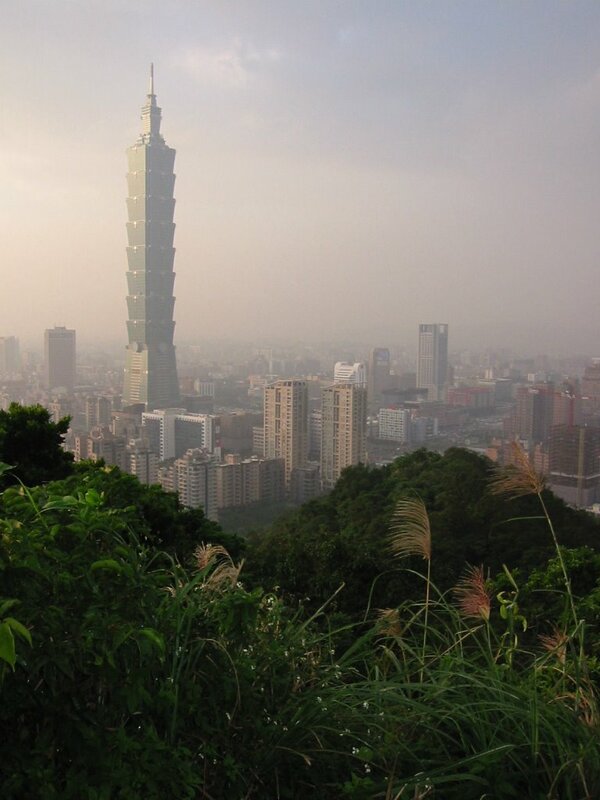 Near the 101 the hike offers incredible views of the Taipei 101 and surrounding areas. The hike itself only takes 15-20 minutes (assuming you’re in moderately good condition), but be forewarned it is very steep so you will want to have good shoes on. There are a couple points on the hike where you can get nice vies of Taipei, but it’s at the top where many of the iconic 101 pictures are taken (often at dusk). If you enjoy history this is a great place to go to. Not only do you get a chance to read about the history of the founding of The Republic of China (R.O.C. ), but the traditional Chinese buildings and the grounds surrounding the shrine are clean, well-maintained, and aesthetically pleasing. You’ll find that in Taipei the government goes to great lengths to make sure that the attractions and transportation around the city are well taken care off. The grand facade of the grounds itself welcomes you with a stunning gate at the front (only) entrance. The two military-clad guards are not so welcoming, as they have been trained to stand motionless in an intimidating rifle-wielding stance and peer through their aviator-style sunglasses straight at their identical counterpart in the equally immaculate garb ten feet or so away. Pay attention as you walk in to the perfectly straight rust colored lines on the white concrete. The lines are evidence of the changing of the guard cerimony that you may be lucky enough to see if you arrive at the right time. On a typical day, there will be about three to five buses parked out front in the parking lot that is little more than a turnout from the busy street out front. Fortunately, the facility is big enough to accommodate the DSLR-toting tourists from China, Korea, Japan, and other nearby countries with a few Western tourists sprinkled in for good measure. The walk from the front entrance to monument is about 100 meters of white concrete surrounded by lush trees, shrubs, and other plants. Once inside you’ll see more guards who bear a striking resemblance to the two stationed out front. Walk around the interior of the building and read the gold-colored plaques on the outside walls to get a full history of the R.O.C. and admire the architecture and craftsmanship of the building itself. You can’t beat the price either as there is no fee. Just walk in. As we mentioned above these are just 4 of numerous places to visit when you’re visiting the Taipei area. If you want a more structured way to see the sights then we suggest you check out Taipei Eats, which does several highly rated Taipei tours, including both food tours and night market tours. You can also consider visiting places a little farther away from Taipei like Taroko Gorge that are pretty easy to get to by train or bus.